Complete the Home Search Criteria form online. Click here for a Home Search Criteria Guide Form in PDF format. Complete the form and use it as a guide when you call me, or click on the Internet form. It’s EASY and I’m very happy to do this for you. There is no obligation or cost. I’ll quickly email the best listings to you. Please be sure to provide your telephone number in case I have questions about your search criteria. Columbia (SC) Area Information & Links (Chapter 4) Columbia is a GREAT place to call home! You will find it to be a friendly place for families, single professionals, and retirees. Columbia, capital city of South Carolina and located in the geographic center of South Carolina, is located just a few hours from the mountains of the upstate and also only a few hours from great beach areas (Myrtle Beach 3 hours, Hilton Head Island 2 ½ hours, and Charleston 1 ½ hours). We have nice weather in Columbia and almost snow-free winters. The population of the city of Columbia is approximately 125,000. The metro area consisting of Richland and Lexington counties has a population of approximately 540,000. Lake Murray / Golf Course Communities (Chapter 6) Lake Murray is one of the premier lakes in the South for living and outdoor recreation. You may choose to live near the lake or live waterfront on Lake Murray or live in a community with lake access. I can assist you with any home buying need in the Lake Murray area. Lake Murray is a 48,000 acre lake in the heart of South Carolina and only a short drive from downtown Columbia. The lake covers an area of 78 square miles with 649 miles of shoreline. The lake is known as a clean water lake and has relatively small water fluctuation levels. The Lake Murray adventure means boating, sailing, canoeing, fishing, water-skiing, swimming, camping and just plain fun at one of the South's most scenic playgrounds. The Timberlake community near Chapin is the one subdivision with a golf course on the shores of Lake Murray. As of late October 2008, the current median price for a waterfront home on Lake Murray is about $611,950 (average square feet = 3330). The average waterfront lot (min. 100 feet) is about $285,000. I live on Lake Murray myself (in the Chapin area). Please call me to discuss your Lake Murray area home questions. 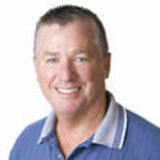 I can assist you with any home for sale on or near Lake Murray. Columbia has a very reasonable cost of living compared to many other areas of the country. A recent comparison to other South Carolina and Southeast locales, revealed that Columbia's cost of living is lower than all of the following (percentage difference in parenthesis): Charleston (5.5), Greenville (1.0), Myrtle Beach (4.0), Hilton Head Island (12.3), Charlotte (2.7), Asheville (6.5), Atlanta (7.1) and Orlando (4.8). Electric rates in South Carolina are on average about 10% lower than the national average. Home values in Columbia are excellent. The average home price for the entire Multiple Listing Service is approximately $140,000. That is for a relatively large geographical area and includes all kinds of homes. Homes prices, may of course, go lower or much higher. Click Here for Columbia Real Estate Property taxes are reasonable in South Carolina. Tax legislation passed in 2006 and implemented in 2007 lowered homeowner taxes approximately 50% at that time. The state sales tax rate was raised to 6% from 5% and all additional revenue is designated to lower owner occupied real estate taxes. In a typical situation, taxes for a residential home would be about .50% to .65% of the market value of a home. As an example, a $200,000 home would have an approximage tax bill of $1,000 to $1,300 (taxes vary depending on actual assessment and millage rates by area). If you are 65 or older, totally disabled or legally blind and have lived in South Carolina for at least one year, you may qualify for the homestead exemption. The homestead exemption excludes the first $50,000 from the fair market value of you legal residence. Home Buying Steps (Chapter 10) Read the Full Nine Step Report Here 1. Planning Stage - Decide on your moving or relocation timeline. Think about your home search criteria and areas of town or neighborhoods that interest you. Do you have enough money for a down payment and for home inspection fees? If you have really good credit scores, you may be eligible for a no down payment or low down payment (3%) program. Home Search Criteria Form: PDF or web page 2. Find and Work with a Qualified Realtor (Buyer's Agent) - Your choice of a real estate sales agent is very important! Buyer representation is FREE. A buyer's agent is an advocate for the buyer in a real estate transaction. Mel Coker’s website 3. Get Mortgage Prequalification - This is a very important step. This will be an assessment of your credit and finances. With a pre-qualification or pre-approval in hand, this can be submitted with an offer on a home. It will make your offer stronger. Recommended Mortgage Contacts 4. Find a home – Mel Coker will assist you with selecting appropriate listings from the local Multiple Listing Service. Focusing on your home search criteria will make this process easy with your Realtor's access to this computerized database of all homes available in the local market. With home search criteria defined and MLS listings pulled, an appointment is set and then the fun part starts... viewing homes. Home Search Form 5. Negotiate Contract Terms - Once you find the home you wish to purchase, you will write a contract offer with your real estate agent. Your agent should pull the property disclosure report(s), tax record and comparables for you. This information will help you make an offer that is appropriate. 6. Home Inspections - Contract terms allow you to have a home inspection completed within 10 business days of contract acceptance. I highly recommend this for a resale home and sometimes it's not a bad idea for a new home. Unanticipated issues arising from a home inspection may be negotiated with the seller for correction. You will also have termite and HVAC (heating and air) inspections completed prior to closing. Mel Coker will assist you with these inspections. 7. Prepare for Closing - Your buyer's agent will assist you with all closing matters. When the contract is finalized you will need to select a closing attorney, and your agent will supply the attorney with a copy of the final contract. You will also need to finalize your selection of a mortgage professional and make a formal loan application (within 5 business days of contract acceptance). 8. Closing - On the day prior to closing, you should be told by your closing attorney or Realtor of the amount to bring to closing. These funds will need to be in the form of a cashier's check or certified check and made payable to the closing attorney. Your Realtor will review the HUD-Form 1 settlement statement prior to closing for accuracy and the closing attorney will review this most important document with you at the closing table. 9. Move and Celebrate! - The negotiated contract states when you get possession of the home and can start moving in (usually the day of closing). The moving part can be mildly stressful, but you now OWN your home! You have achieved the American Dream! You've made a smart move financially! Congratulations! An Internet Special Bonus for You (Chapter 11) Ready to Buy (or Sell) a home in Columbia, South Carolina? Please be sure to contact Mel Coker for the best in Columbia real estate service. Mel says “service is everything”! 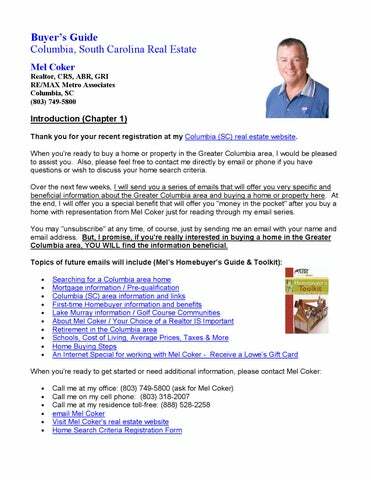 Thank you for taking the time to read through my online course – Buyer’s Guide for Columbia Real Estate. I really do want to help you buy your next or first home in Columbia. I’ve had over $60 million in home sales volume during the past 10 years. Each transaction is very important to me. If you contact Mel Coker to buy your home, I will provide a very nice gift to you at or after closing. This is a very special offer and you must tell me (telephone or through email) that you completed the online course (through email or the PDF version online). When you do this, I note this on my client record for you. At closing, I will provide you with a Lowe’s shopping card worth the following: .00125 x home closing sales price (rounded to the next highest $25 increment) Example: $175,000 purchase price x .00125 = $218.75 or Gift card from Mel Coker = $225 (This program starts for closings on and after November 1, 2008) Additionally, I will sign you up for available special offers from Lowe’s including a discount coupon and Lowe’s e-newsletter. I am a partner in the Lowe’s Realtor Benefits program so that I can offer these benefits to my real estate clients. Thank you! A guide to buying real estate in Columbia, South Carolina. Presented by Mel Coker, lifelong Columbia resident and RE/MAX Realtor.